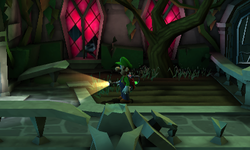 The West Balcony is a room in the Treacherous Mansion in Luigi's Mansion: Dark Moon. The West Balcony is just that, a balcony. The West Balcony provides a view to the Front Entrance, letting Luigi see the top of it. The West Balcony is made out of stone, with most of the guard rails shattered, this room provides an entrance to the top of the Dark Age Exhibit. The West Balcony has a farm in it with a tree and a few pumpkins. The tree has a few Crows, and the pumpkins, when sucked up with the Poltergust 5000 and thrown at a wall, reveal 4 coins. The West Balcony also provides a view to the Space Exhibit. In mission A Train to Catch, when the Space Exhibit is viewed after the Strong Poltergeist has taken the yellow book, the player can see the Strong Poltergeist looking at the book and rotating it, never noticing Luigi. This is a hint to where to go fight the Strong Poltergeist. The West Balcony is a completely optional room, having Luigi never need to go to it to complete the game.